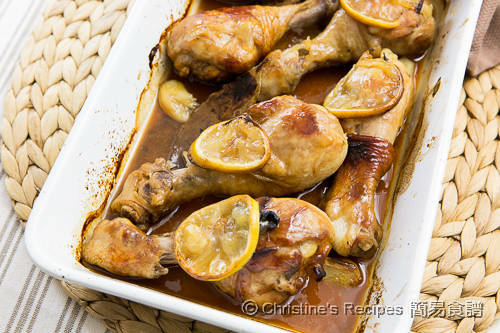 What we loved about these baked chicken drumsticks is their juicy and succulent meat with tasty lemon and honey sauce. No matter tucking in with our clean hands or knife and fork, we felt the finger lick'n drumsticks are so good. To make this dish, either for your family or party finger food, it won’t be wrong at all. One side note, either thawed (if frozen) or fresh drumsticks can be used to make this delicious dish. Rinse the drumsticks and pat dry with kitchen paper. Mix with marinade and set aside for 30 minutes or overnight (put in fridge with cover). Preheat oven to 200C / 390F. Heat oil and saute the garlic cloves until aromatic over medium-high heat. Don’t burn them though. Add drumsticks and cook until both sides are lightly brown. 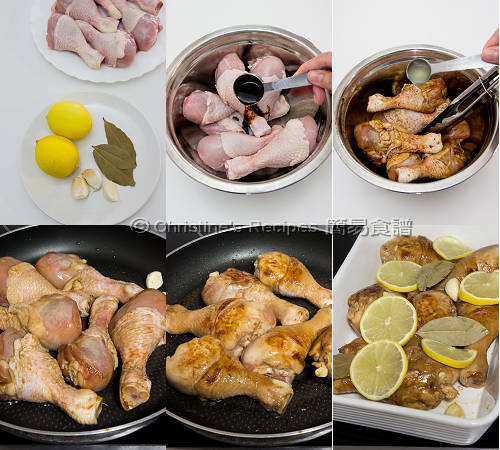 Transfer the drumsticks and garlic with the marinade into a baking dish. 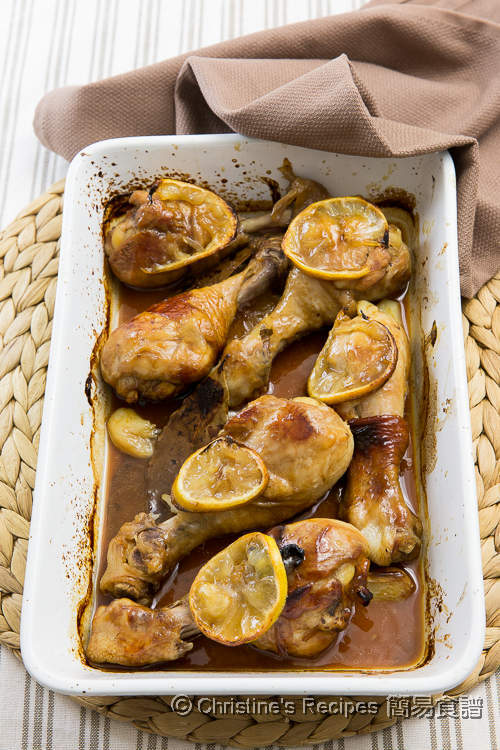 Place lemon slices on top of the drumsticks. Add bay leaves. Pour in the chicken stock. Bake in the preheated oven for 30 minutes. Carefully remove the baking dish from oven. Flip the drumsticks to the other side. Drizzle honey over the drumsticks. Continue to bake for a further 15 minutes. Serve hot. After adding honey, don’t leave your drumsticks unattended as you don’t want them to be burnt. Kecap Manis is a kind of Indonesian sweet soy sauce, with an aroma of palm sugar, available at Asian grocers and supermarkets. Hi Christine, can I add lemon zest? If yes, how much should I add? Thanks! Sure, why not? Lemon zest will add a stronger fresh fragrance. Hi, love your recipes, I was wondering if I can substitute light or/and dark soy sauce instead of using Kecap Manis. Thank you. Light and dark soy sauce will work, but your dish will lack of a unique aroma and sweetness that produced by Kecap Manis. If you don't mind, why not? It will be hard to find. Could I add sugar to soy sauce? You may use some brown sugar to make your own sweet soy sauce.